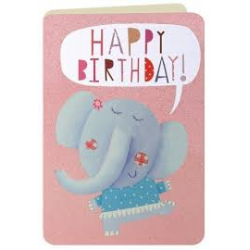 Jumpin' Jacks Toys has a superb range of kids birthday cards for boys and girls that feature various themes, including fairies, dinosaurs, bicycles, crocodiles, cup cakes and many more. Our kids birthday cards are the perfect addition to our many great gift ideas that you'll find in our kids toys, books and games sections. Few days of the year are as important to us as a friend or loved one's birthday.Inside reads: WISHI..
A perfect card to send lots of birthday wishes to someone on their special day.Inside left blankSen..
You are a ONE-derful! Happy first birthday!Card measures 120 x 178 mmInside is left blank.. These cards are printed on textured board and glittered.They feature die-cut edged on three .. Happy birthday card with a cacophony of canines, cake and balloons!This birthday card has been intr.. Happy birthday card with a menagerie of monkeys, balloons and presents!This birthday card has been .. Vibrant and sparkly, the cards feature hand painted jungle animals - some more unusual than others ..
New from Rachel Ellen range!Printed on beautiful textured board with vibrant neon inks and finished.. This lovely card measures 120 x 178 mmInside reads: Happy Birthday to a Special little Man!S..
Rule 1: All 4 year olds have fun on their birthday...and every other day of the year. Rule 2: Do no..
Lovingly letterpressed at 1973 HQ using a 1962 Heidelberg Windmill PlatenBlock colour printing on l.. Inside reads: Love, Hugs and Kisses and first Birthday WishesSend your order directly to your loved..